Well, with Hallowe’en behind us, it’s officially Christmas all the time at Sweet Scarlet rehearsals. Actually, we start preparing for this very special time of the year in the summer months… and this year is no different, as we are adding nine new numbers to this year’s show. You can expect some of your favorites like ‘I’ll be Home for Christmas’ and ‘O Holy Night’, as well as some new soon-to-be favorites like Pentatonix’s ‘That’s Christmas to Me’ (because of course we must pay tribute to our absolute favorite a cappella group PTX!). This year’s show is Home for the Holidays – it’s a special time of year for each of us because it means we get to sing joyous Christmas music together, and share this magical time of year with our families, and you, our sweet fans. This year’s show is particularly focused on home and how important family and music is in our lives. Last year’s show was sold out before December 1st, and we hope that this year will be another sellout! 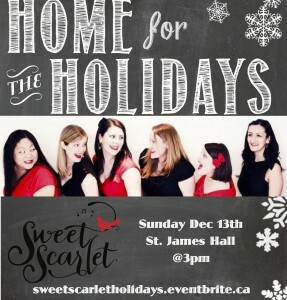 Sweet Scarlet’s Home for the Holidays will be on Sunday, December 13th at 3:00 pm at St. James Hall in Kitsilano, Vancouver. Tickets are available now here: www.sweetscarletholidays.eventbrite.ca. For a little Christmas spirit and taste of what to expect, check out our brand new Christmas promotional video! (If video link doesn’t show, visit our Youtube Channel). In addition to our own show, we love to share the Christmas love around our community and will be doing a number of performances throughout December. We’re particularly excited to participate in Yule Duel on December 3rd 6:00pm – 9:00pm on Water Street in Gastown, Vancouver. Why are we so excited? Because this event has a sing-off component … yes, you heard us… a SING-OFF! And if you’ve been following us lately you will know that this is basically an a cappella dream come true for us! So, join us on December 3rd on the streets of Gastown to hear a number of choirs and vocal groups from across Vancouver share their favorite Christmas tunes, and then show down at the end of the night. This special event is a fundraiser for ‘May’s Place’, a key resource in our community, delivering hospice care and compassion to vulnerable and marginalized people in the Downtown Eastside. Sweet Scarlet is fundraising for May’s Place and we hope to contribute over $2,000 to Yule Duel and May’s Place this year. Help us! To make a donation and support this important cause, please visit: http://yuleduel.com/media/choir/sweet-scarlet/ where you will find our profile and the option to “Donate Now”. Just $32.50 means one person will receive one day of compassionate end-of-life care, free of charge. Any little bit helps, and we truly appreciate your support. Check out www.yuleduel.com for more information on the event. Thank you in advance to our amazing and supportive sweet fans!